It is time to talk about another use for honey. In this case it’s a use for uncured nectar that would be unstable on a shelf. As many already know if honey isn’t cured to proper moisture content it will ferment. I have seen the results of high-moisture honey in bottles and it gets messy with all the bubbling, bursting, seeping, and sticky stuff everywhere. Common rule-of-thumb is that honey needs to be less than approximately 18% moisture to prevent fermentation. There are methods of drying it down and at a later date I may go over that, but I’ve got other plans for this stuff. Bees through their own form of intelligence will not cap a honey cell until it is at the proper moisture content. Therefore any frame that is less than 80% capped gets set aside. Once the salable honey is extracted the frames with uncured nectar are done last. 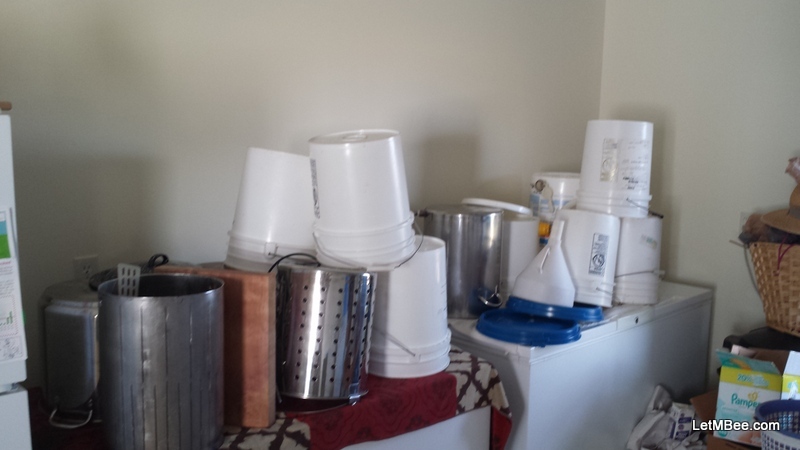 All of this high moisture honey is put into buckets labeled “Mead”. 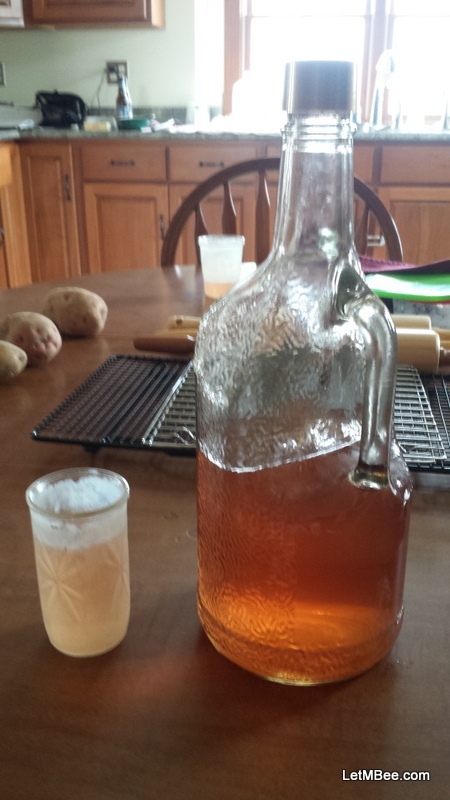 This year I had enough high mositure honey from 9 production hives to make two barrels of mead. 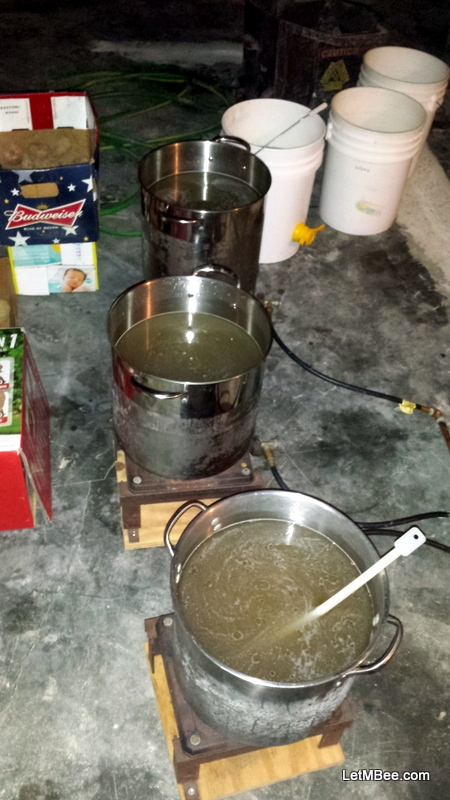 For the last several years I have had to make fermented beverages in other people’s basements. This is better than nothing, but when I run out it means I have to go somewhere for a refill. We moved into our new house a couple months ago. 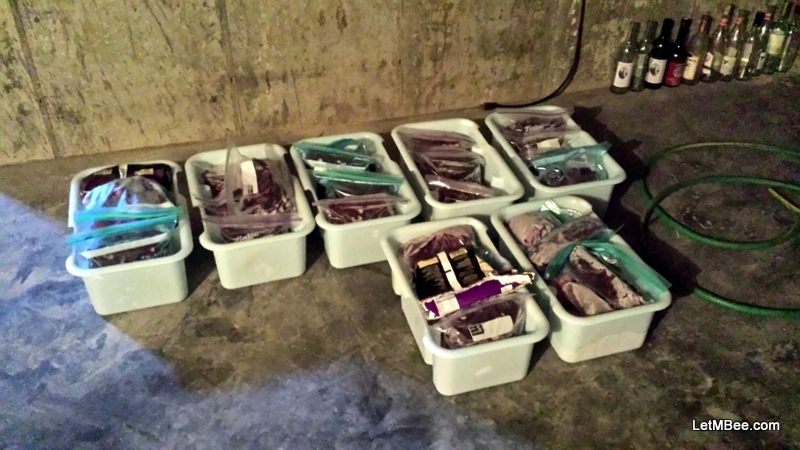 During the moving process we discovered that there were about 30 gallons of blackberries in our two deep freezers. Lack of a basement for 7.5 years had me ITCHING to start fermenting at home. Holly was more than happy to get her freezer space back too. The first order of business was setup. The fruit had been fermenting for about 2 weeks in the primary (a large vat) and was ready to be pressed. This was not the optimum time interval, perhaps a week too long, but the work schedule dictates my availability for other tasks even mead making. Propane burners were used to heat water so the uncured honey would go into solution more easily. The fermented juice along with the water/honey mixture were poured into the barrel. 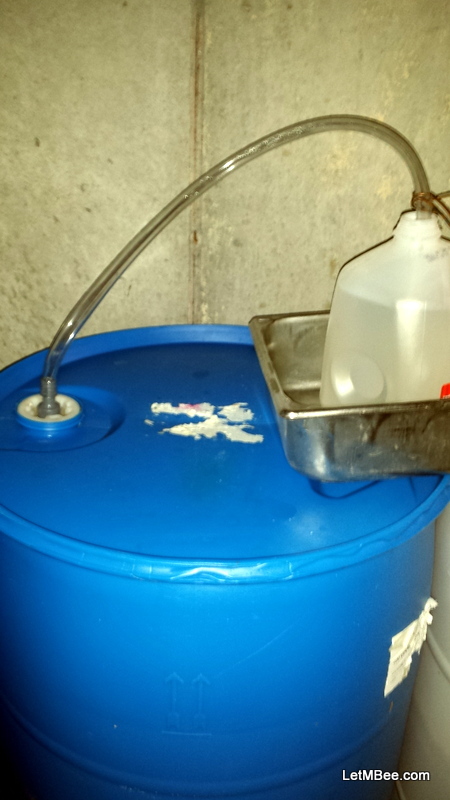 Once the barrel had been filled to the desired level a home-made Airlock was put in place. This allows carbon dioxide to escape while preventing bugs from getting in and ruining everything. There may be wine purists out there giving me grief for using a plastic barrel. The entire pressing process took about 6 hours including cleanup. 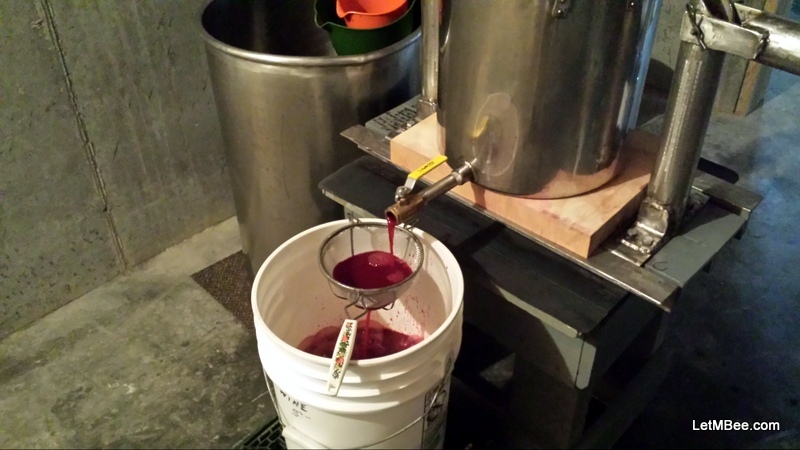 Maintaining cleanliness from beginning to end is the most time consuming part of mead making, but is important when the goal is a good tasting beverage. Everything was washed and allowed to air-dry on the freezers. It seems like all of my activities create HUGE messes. At least that is Holly’s opinion. Now it’s time to wait. The scheduled opening for this barrel will be my son’s Birthday early year in April. I have put a reminder in my Calendar to write a Mead Review after tasting. Important Note: The only way to be certain of moisture content in Honey (that I am aware of) is to test it with a refractometer. Taking several samples from each bucket before bottling your saleable honey is the best way to make sure you keep happy customers. Alright…. What are you doing with your honey? This entry was posted in Honey, Posts, What's going on.. and tagged honey, Indiana Beekeeping, Mead, treatment free beekeeping. Bookmark the permalink. I am salivating reading this post. I have not made any mead beverages yet – give me time. Having two very young children, drinking has not been top of my agenda of late … but I want to get back to that place! Do you have small hive beetle? To keep myself out of trouble, I’ve written a couple of pages over the Xmas period: Beekeepers Guide To The Small Hive Beetle and Beekeepers Guide To The Asian Hornet. Hope you find them useful/interesting. Mead is good that’s all I’ve got to say. Used 60# of honey making it last year and 180# of unripened nectar (20-something %) toward it this year. Having a teenage daughter has made drinking more a part of the agenda lately at my house. The main attraction to me is that I am cheap. I like to grow stuff and ferment it. Having not quite ripe enough nectar around is a good excuse to use it for something. I’ve seen SHB at 3 hive locations as well as several of my trapping locations. There are areas I know when a swarm hits a trap there will be SHB in residence. In the places they are established they are part of the fauna and will be for the foreseeable future. I have noticed that in my dealings with SHB that good strong hives tend to just take their presence in stride. I have resorted to hiving caught swarms that originate from known SHB locations in other locations I know already have SHB. From my observation they will hurt a less hardy hive, but I see that with varroa way more. Really strong hives if left to themselves routinely produce 4-5 mediums of with SHB living in there. Significant numbers. It is evident they are there when the inner cover is removed. At least 100. I don’t feed so there is way more honey left on the hives at all times. I have never had issues with fermenting honey. Hives have died there, but I have never been able to finger SHB as the culprit. Varroa is way more virulent a pest I think. SHB seem more of a nuisance to those bees than anything. Here SHB seems to be restricted to moist damp conditions in the more wooded and hilly hive sites located adjacent to the large drainages. The colonies living in the treeless heavy agriculture areas do not have SHB generally. I have had hives in one location since 2010 and never seen a SHB ever. That is the site I first saw varroa on drone comb. I will be checking out your links. Take care. Interesting that you find varroa the more significant threat – I guess it varies by region. Strong colonies sound like the best defence. I’ve written about feeding honeybees – a useful way of helping them become a stronger colony. So – the drinking – is this because of having a teenage daughter or with her. With a 2 year old and 3 month year old, I haven’t had to think about drink strategies yet. Varroa and the diseases they harbor/transmit seem to be the biggest problem for me. I am sure every location has their own specific hurdles. We have different opinions on feeding, and that’s ok. My management program is to start out with strong feral colonies and allow the ones that don’t make the cut to expire, just like nature does. Feeding is a drain on the operation so bees that require feeding aren’t bees I want to keep. In orde to maintain profitability into the future I need profitable stock. To some this may seem alien, but it’s just business. I highly recommend the Treatment-Free Beekeeping Group on Facebook as well as the podcast put out by the guy running the group, Solomon Parker.